The time of year has come when many of us are crunching numbers, reviewing our finances and prepping our taxes. It’s no different here at Blue Cross. We have just wrapped up preparing and filing our yearly financial results. Now is good time to pause to reflect on how we have delivered on our promises to you, our customers. I’m glad to report that we were able to deliver results that show strength for our customers and for our company. We ended 2016 with an improved net income of $185 million, or 2.4 percent, and significantly narrowed losses from Affordable Care Act (ACA) plans. This means our profit was just under two and a half cents per premium dollar. We did this during one of our most challenging operational years on record as we upgraded new technology systems and prepared to onboard over 200,000 new ACA members moving from insurers who decided to exit the market in North Carolina. Much like your bank or credit union, it’s a good thing when the company you have chosen is strong and competitive. This means you can rely on them to provide you with financial security to meet your current and future needs. A health insurance company is no different. We must remain financially strong in order to not only pay the medical bills, but in order to make necessary investments that meet the emerging and diverse needs of our customers. Our ability to do this is tough enough in stable times but it is particularly challenging given how unpredictable our industry is right now. We’ve had a lot of change, risk and uncertainty. At this time, we’re the only insurer covering all 100 counties in the ACA marketplace. We also don’t know the medical needs of the 200,000 new ACA customers I just mentioned, and this presents a challenge. Financial strength is important to overcome all of these obstacles. Blue Cross works to meet the needs of our customers by taking a longer-term view of how we operate and manage our company. For example, we do not prepare quarterly financial briefings for shareholders. (We actually don’t have shareholders – more on our company’s structure here). We focus more on longer-term cost trends in order to forecast premiums accurately for members. Speaking of premiums – how can you tell how well a health insurance company is managing your premium dollars? 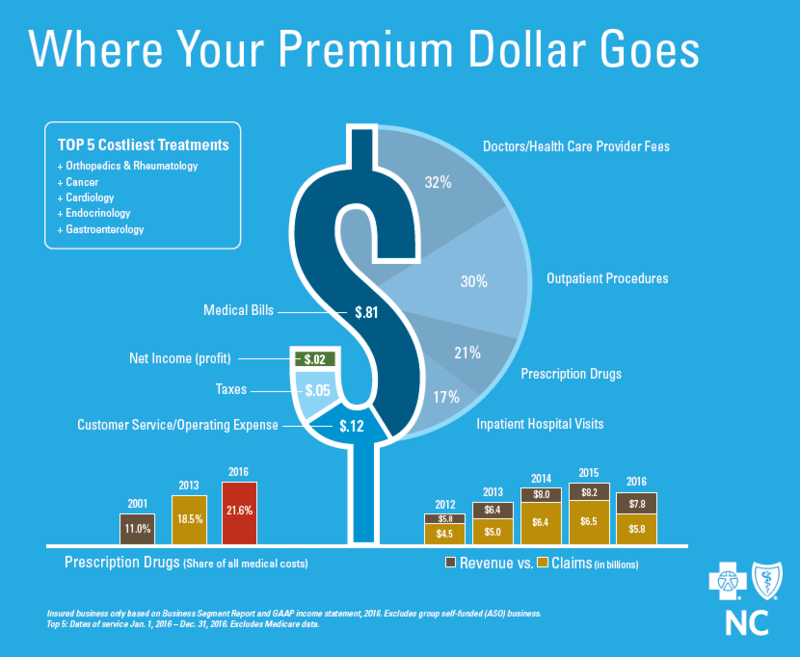 A good benchmark is how much of your premium dollars are going towards your healthcare services. On average, we spent more than 81 cents of each premium dollar on healthcare services in 2016. This means that the overwhelming majority of your premium dollars are going directly to your healthcare. We also have a consistent track record of exceeding federal requirements for the portion of premiums that we must spend on medical care. Gastroenterology, rheumatoid arthritis, cardiac care, and orthopedic costs remained high, especially for people who purchase their own insurance. Hospital outpatient costs continue to climb due to higher use of cancer drugs given in these facilities. We saw an uptick in dialysis and cancer care costs in 2016. The share of premiums going towards prescription drugs continues to rise at a rapid pace. In 2014 and 2015 combined, we reported an overall loss of more than 400 million dollars, primarily due to higher than expected medical costs for ACA customers. We still reported losses on ACA plans in 2016, but they were much less at $38 million. We were able to offset these losses by improvement in other lines of business. Our ACA membership was down slightly from 2015 compared to the end of 2016, at 250,982. Overall, ACA customers are sicker, and use more expensive services at a higher rate than other customers. These customers’ claims costs were 65 percent higher than non-ACA customers under the age of 65. We also saw them seek more costly care for orthopedic procedures, cancer treatment, and diabetes. 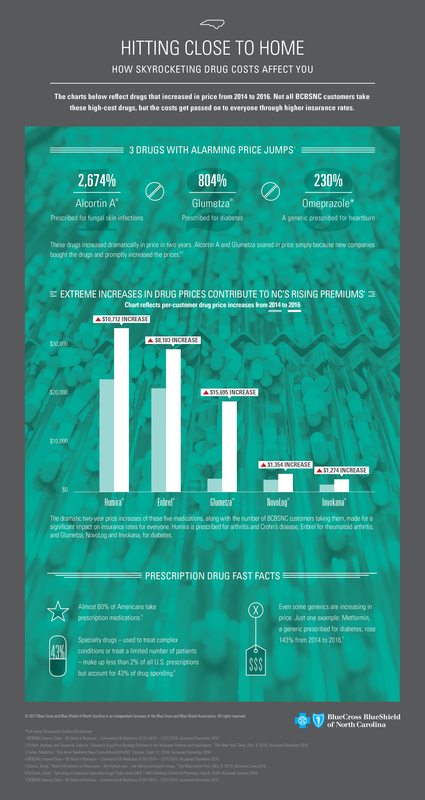 Across the board, drug costs continue to rise at a rapid pace. It’s no longer just specialty pharmacy drugs– even generics have started to increase rapidly. We saw a rise in diabetes drugs in particular. Insulin is a 95-year old innovation, yet costs continue to rise. Our customer’s share of premiums going toward prescription drugs continues to grow. Drugs now make up about 22 percent of all health care costs. This has roughly doubled over the past 15 years. While we can’t predict the future, we know that any changes coming from Washington could impact health plans significantly. Proposals under consideration for the health care industry must take steps to support a stable marketplace and must improve the system by focusing on the larger issue of rising healthcare costs, which lead to higher premiums. Amid the uncertainty we’re all feeling, our entire team here at Blue Cross remains committed to making every dollar we spend count for you. We will focus on staying financially strong and competitive over the long term so that we can continue to be here for our current and future customers. I will be tireless in my own work to ensure that our customers maintain access to high-quality health care, while protecting their financial well-being. Mitch Perry is Senior Vice President, Chief Financial Officer and Treasurer for Blue Cross and Blue Shield of North Carolina. 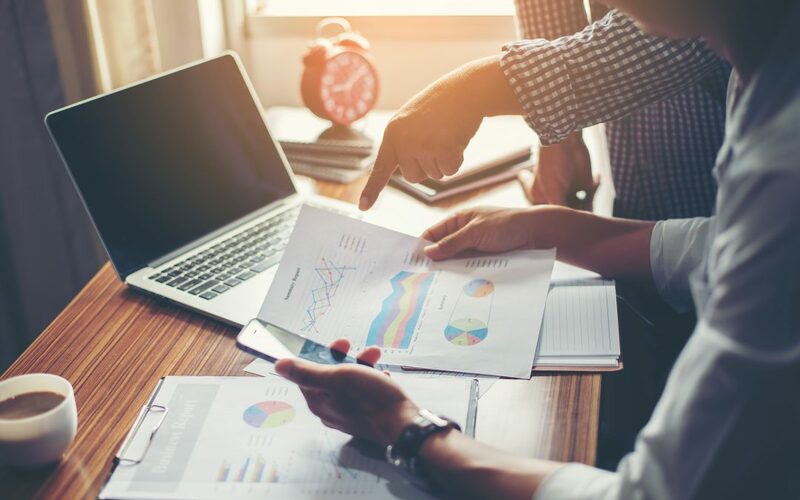 He is responsible for treasury, investments, financial operations accounting, financial reporting, business planning, and tax compliance for the company. Mitch has more than 25 years of broad financial management experience in the insurance and energy industries and in providing financial consulting services to various industries.